Up to AU$425k + oncall. Sensational lifestyle opportunity for couples or families. Well funded, well resourced, collaborative mental health service - the largest in Queensland outside of Brisbane. I am now accepting formal applications for the position of Rehabilitation Psychiatrist in the Townsville Hospital and Health Service (THHS). 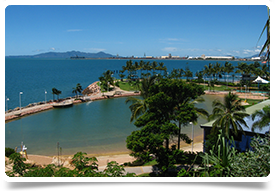 Townsville is a city with 200k people and sits on the beautiful Queensland Tropical Coast. Townsville has arguably one of the finest independent schools in Queensland and also hosts James Cook University with a very good reputation in science and medicine. The Rehab service includes a 27 bed residential facility, a mobile intensive rehab team, a secure rehab unit, a community care unit and an acquired brain injury unit. The city is perfect for singles, couples or families. Large enough to provide work opportunities for partners (medical or not) Townsville does not have traffic or pollution issues. It is laid back and has a marina and beachside area with many bars, cafes and restaurants. Townsville has more than enough to keep the kids active, outdoors and engaged: beaches, parks, hinterland, surf, sailing, swimming pools, cricket ovals, football pitches etc. and is very family orientated. The hospital campus is a first class facility with a 36 bed acute mental health unit . Outside of Brisbane, THHS is the most comprehensive mental health service in Queensland and has a exceptional Medical Director with very strong ties to James Cook University. The group is collaborative with a supportive matrix of peer group support with excellent administrative/operational resources. It promotes a Recovery approach with the patient at the centre of its philisophy. FRANZCP or equivalent in UK, Ireland, Canada or USA. If not FRANZCP, then a minimum of three years experience at Consultant/Specialist level. You will have completed your specialist training in a comparable country of training: UK, Ireland, NZ, Canada or USA. Have had a formal post of at least 6 months in CAMHS/Learning disability during your basic or higher training. Deep knowledge of contemporary psychiatric practises. Ability to practise within a cross-cultural context.